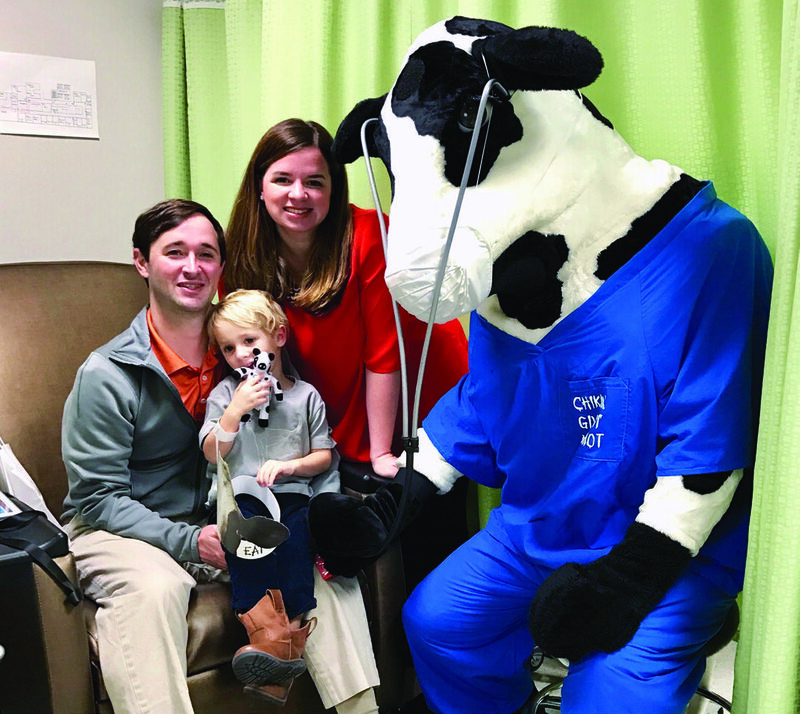 Chic-Fil-A sent their cow to visit Craw-ford at the St. Jude Affiliate Clinic. Do you know that nagging gut feeling? The inner voice telling you when to be on guard or when to open your heart, even when it may be hard? I always struggled with what to call that feeling, those gentle nudges you experience in life, guiding you in one direction or another. And I often ignored them, dismissing this gut feeling as anxiety or irrationality. But that changed the night of October 10, 2017. The weekend prior, while entertaining family and friends, I came down with a particularly nasty virus, eventually infecting my husband Michael and son Crawford and literally everyone else (after all, I helped to prepare the food!). When I realized the severity of the illness, I panicked, worrying about our two younger children–Leolene, who was one and a half years, and Eliza Grace, three months at the time. Eliza was too young to catch an illness that intense. It took the weekend, but we recovered without the girls getting sick. But I could not shake this feeling that danger loomed. Every fiber of my being was on alert. It had been so strong the week before that I’d called my doctor to ask if I could be suffering from postpartum depression. When everyone was well by Monday morning, we proceeded into our week normally. But Monday night, our son ran a low-grade fever. Something in my gut told me it wasn’t right. But my gut had always told me that about him, and countless doctor appointments and evaluations had proven me wrong for three years. Tuesday morning, he woke up without a fever and bounding with energy. We chalked that fever up to the normal immune system of a young child. That night, our son asked if he could make a pallet on the floor of our bedroom, so he could sleep nearby. It was an odd request. But our 3-month old was sleeping in a bassinet in our room, and we figured a little jealousy regarding the addition of his new sibling was setting in. It was also my first week back at work after maternity leave. But while I was laying his blankets on the rug, something took over my body. I had an intuition so strong to look in the direction of where he was playing that I literally couldn’t stop myself. I looked. “Margaret, did you see that?” There was no one there but me, Crawford, and a sleeping baby. Crawford had grabbed his right upper abdomen and winced. It was an odd thing for a young child to do. Something again, forced the words out: “Crawford, does your belly hurt?” “Yes, Mama, it does hurt,” he replied. I then proceeded to follow a strong intuition to do things I’d never done before. I laid him down on my bed and started rubbing his belly. I felt nothing. But something told me to dig deeper, so I did. The first day Crawford was declared NED–no evidence of disease! A mass. I felt it just as plain as day. A fist feeling mass below his right rib. I screamed for my husband who was upstairs working, convinced I’d just found a tumor in our 3-year old. And in that instant, our perspective on life changed. While in the ER waiting room, sitting next to our happy and healthy-looking son, I found his diagnosis courtesy of Google on my iPhone. When I read about Hepatoblastoma, a one-in-a-million chance liver cancer affecting children five and under, I was convinced that was what he had. Every symptom that bothered me about him was listed under the condition. Later that night, the doctors confirmed to my husband and I our worst fear—Crawford did have liver cancer. While God and the doctors were saving our son, I was being saved myself. You see, I have always struggled with my faith. I’ve done the work, read the lessons, and supported my community. But I never had that “ah ha” moment. But through this season of suffering, I’ve been led to a much deeper faith with God as I watched him provide to us exactly what we needed right when we needed it, often when we didn’t realize we needed it. It has led me to a place of complete trust and obedience in Him – and peace. 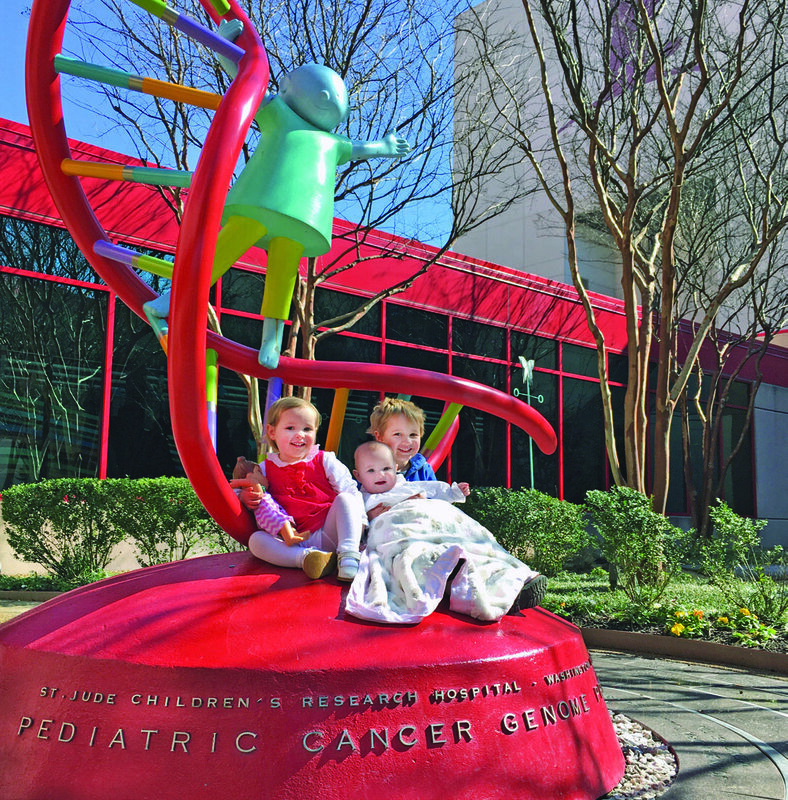 Why did I feel called to serve at the new children’s hospital while driving on the interstate two weeks before his diagnosis? Was God working on my heart already, knowing what was ahead? What was that voice that led me to discover Crawford’s cancer that fateful night? What was the weighted feeling I felt on my shoulders that first night in the ER as I watched a somber sonogram technician measure multiple masses on my son’s liver, as my first panic set in? There was no one there, and in a moment of devastating discovery, I physically felt touched on my shoulders and an instant calm came over me. Was it really just coincidence that we’d bumped into Crawford’s ELC teacher that next night at ten o’clock, twenty-four hours after he was diagnosed? Mrs. Joanetta was the first person to hear me say out loud, “Crawford has cancer.” She then stated words to me that I truly believe were God’s intervention, reminding me: God is good, God is love, and the best path forward is to surrender and put my absolute faith in Him. She helped to set the trajectory of the journey we were on, as did many, many other friends. 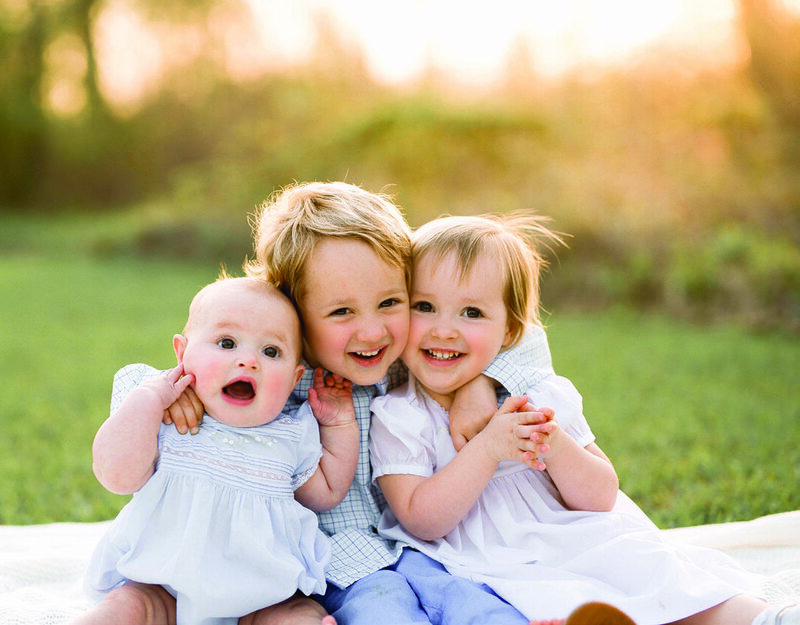 Taken the day after receiving Crawford's first set of clear scans…one of my favorite photos of the kids. There is a song by Kristene DiMarco titled “It Is Well,” where the lyrics state: "So let it go, my soul, and trust in Him/ the wind and waves still know his name." It was inspired by Matthew 14:29-31 and the original hymn with the same title. Isn’t it a beautiful reminder that our God is trustworthy, sovereign, and capable of giving us peace that surpasses all understanding, even in the midst of our suffering? I’ve listened to it so many times that the words are forever etched on my heart. And in Colossians 2:6-7, we are encouraged to live our lives rooted in Christ, strengthened in faith, and overflowing with thankfulness. This verse has also spoken to me deeply, reminding me that by focusing on thankfulness, we’ve been able to heal and accept God’s plan for our lives. The worries associated with childhood cancer don’t easily leave you, but we enter this new phase of life with great peace in what is to come, no matter how joyful or hard it may be. And we send praise for the good that has come out of this situation: opportunities to tell our story and new ways to positively impact our community, none of which would be possible if not for the trials we’ve gone through. Through every part of this very difficult journey, we saw His grace and care through the love and support of our community. 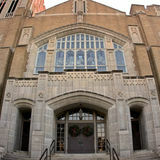 From the bottom of our hearts, we thank the FUMC community for rallying around us.